The 2017 Bouchercon World Mystery Convention, in Toronto, Canada, concluded more than three weeks ago. Normally, we post photos soon after a convention, but this year the whole experience of Bouchercon was so powerful that I felt unable to post about it until now. 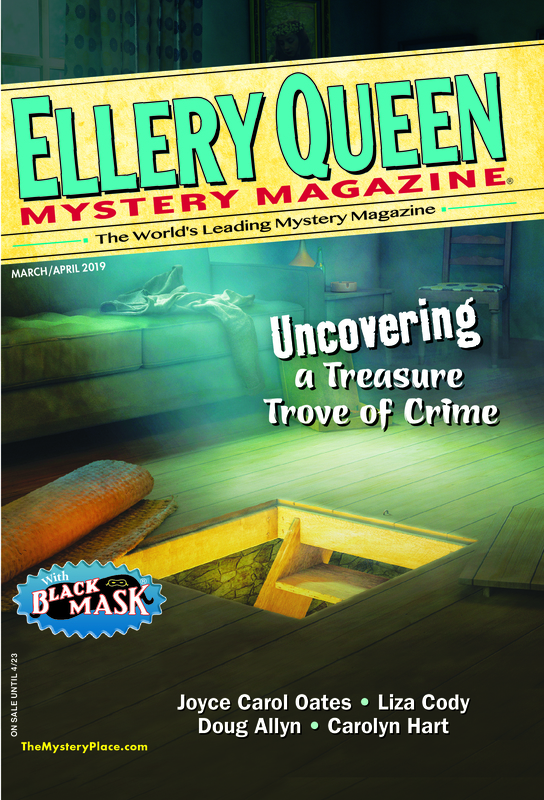 As a guest of honor at this year’s events, Ellery Queen’s Mystery Magazine was invited to a dinner hosted by convention co-chairs Helen Nelson and Janet Costello on Wednesday, prior to the official start of programming. There I had the pleasure of meeting, or reconnecting with, not only Bouchercon 2017’s special guest authors but some of the incredible volunteers who make Bouchercon possible. It was a delightful evening. Then, on Thursday afternoon, came a dedicated EQMM hour. After a short interview with me by Art Taylor, fifteen of our authors each spoke for a couple of minutes about the magazine and their connection to it. This was something I’ll never forget. A mix of old friends, longtime contributors, and new authors (a couple of whom I’d never met before), their recollections—some going back a half century!—were moving and illuminating. With seventy-six years of continuous publication behind it, EQMM is one of America’s longest-running periodicals. That kind of longevity is only possible through the work of many talented contributors and a loyal and discerning readership. But what impressed me most forcefully at this event was the role love has played in sustaining our magazine. In one way or another, it shone from what each person said. I feel immeasurably grateful for my own connection to the magazine and to the “family” that has grown up around it. We have not yet been able to gather photos of all of those who participated in this celebration, but we’ll put them up as we get them. Warmest thanks to all! Janet Hutchings and Art Taylor at the event honoring Ellery Queen’s Mystery Magazine for Distinguished Contribution to the Genre. Photo courtesy of Josh Pachter. Brendan DuBois presents at the event honoring EQMM. Photo courtesy of Josh Pachter. Martin Edwards presents at the event honoring EQMM. Photo courtesy of Josh Pachter. Bouchercon Friday found me on a panel moderated by James Lincoln Warren about the art of short-story writing. Anyone who’s attended the short-story panels of previous Bouchercons knows that attendance is often sparse. With his ingenious idea of devoting the hour almost entirely to audience questions, Jim managed to pack the house, with standing room only. I learned a lot from my fellow panelists, as we talked about everything from flash fiction to the novella. “5-Minute Misdemeanors: Constructing the Short Story” panel. L to R: James Lincoln Warren (moderator), Alan Orloff, Janet Hutchings, Travis Richardson, Angel Luis Colón, Barb Goffman. Photo courtesy of Jackie Sherbow. “Noir is the Beat Up Black” panel. L to R: Rob Brunet (moderator), Lili Wright, Ed Aymar, Christopher Brookmyre, Janet Hutchings, Harry Hunsicker. Photo courtesy of Jackie Sherbow. As anyone who’s ever attended a Bouchercon knows, eating and drinking with friends, authors, and colleagues is as important as any of the formal events. I did a lot of that this time, and had the extra pleasure of being joined by EQMM and AHMM’s associate editor Jackie Sherbow. Out of those conversations came the inspiration for a couple of new social-media ventures for EQMM and AHMM. As of last week, both magazines launched Twitter and Instagram accounts. You can find us here: @eqmm (Twitter) and @elleryqueenmm (Instagram). L to R: Bill Crider, Angela Crider Neary, and Dana Cameron. Photo courtesy of Dana Cameron. Clockwise from L to R: Toni L.P. Kelner, Dana Cameron, G.M. Malliet, Bill Crider, Janet Hutchings, Angela Crider Neary, Charlaine Harris, Paula Woldan, Brendan DuBois. Photo courtesy of Dana Cameron. Clockwise from L to R: Richard Helms, Twist Phelan, Martin Edwards, Art Taylor, Elaine Helms, Christine Poulson, and Janet Hutchings. Photo courtesy of Twist Phelan. Clockwise, L to R: Jane Cleland, Linda Landrigan, John Landrigan, Melodie Campbell, Jackie Sherbow. Photo courtesy of Brendan DuBois. This entry was posted in Awards, Conventions, Ellery Queen, International, Magazine, Readers, Writers and tagged bouchercon, bouchercon2017, convention, ellery queen, eqmm, readers, toronto, writers. Bookmark the permalink.